We are not accepting new orders for lumber, logs or firewood at this time. 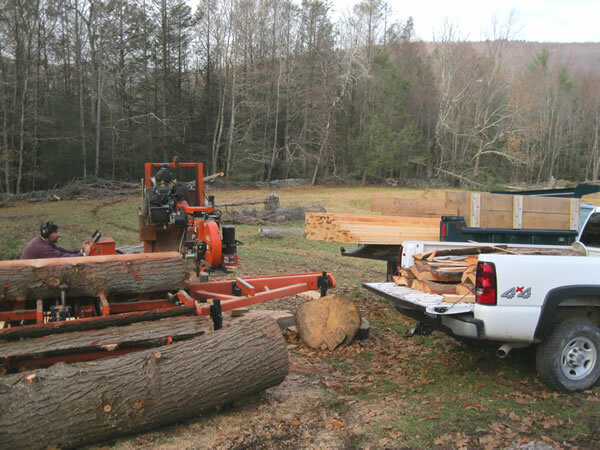 Lackawack Lumber can mill wood at our location or yours, using a portable Woodmizer mill. We’re located near Rondout Resevoir on Lackawack Hill, outside the town of Napanoch, NY. Rough-cut lumber or finished wood. We manage our woodlot using environmentally friendly timber management techniques, in an effort to improve the health of the land and promote better conditions for wildlife. Our regular replanting program adds a mixture of hardwoods including white oak, sugar maple, walnut, and cherry trees. 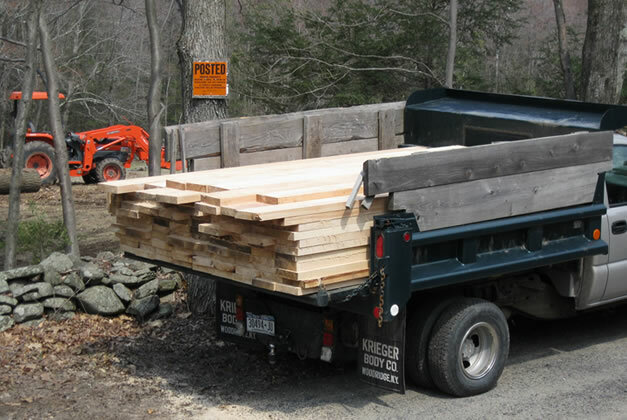 Some of our lumber is milled for our own projects (such as renovating a 200 year old barn). 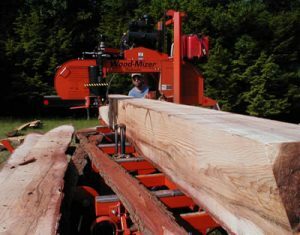 Steve enjoys milling Hemlock into beams and Pine into boards. 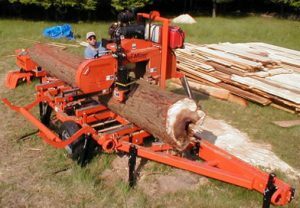 We can mill lumber up to 21 feet long and dimensions as large as 12×12. Standard plank widths are available as well as non-standard sizes and planks as wide as 16 inches or more. 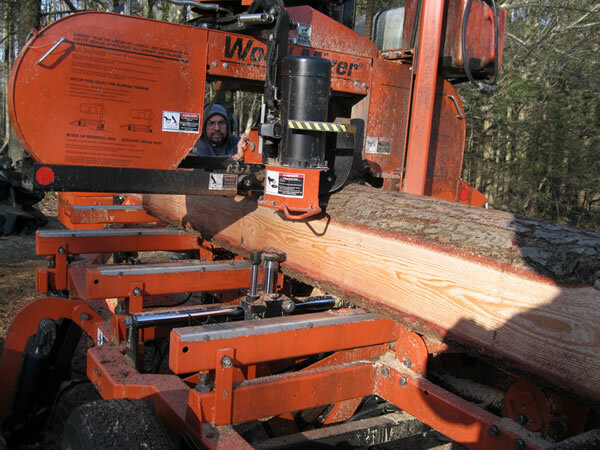 For framing, post and beam and general use lumber we use Hemlock for it’s strength and durability. For smaller projects and interior work we use White Pine for it’s ease of use, light weight and excellent finishing properties. Hardwoods are available for finish work such as flooring, cabinetry and furniture. 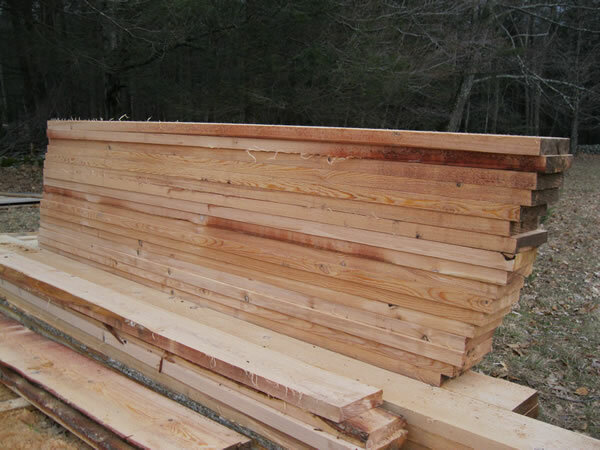 Lumber can be purchased green off the mill, dried yet rough cut, or planed and finished. 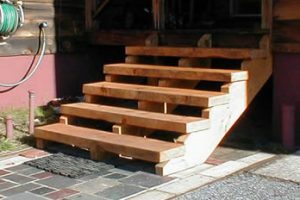 As a small mill operation we can handle most special orders and custom sized lumber requests that most stores or lumber yards would not be able to satisfy. © Lackawack Lumber mills boards, plants trees, grows a garden & sells organic chicken eggs & pure maple syrup in Napanoch, New York. Serving Ellenville, Grahamsville, Kerhonkson, Sundown, Rondout Valley.